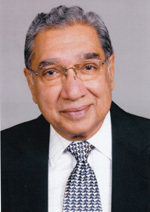 Walter Vieira (certified management consultant or CMC) was among the first to be elected a Fellow of the Institute of Management Consultants of India (FIMC); and also the first to start a marketing consulting company— MAS—in 1975, in Mumbai, India, after a 14-year successful career in the pharmaceutical industry, with Glaxo, Warner and Boots. In a span of over 40 years, Walter has worked with many of the largest companies in India—both multinationals and Indian—which have been family-managed or corporates. MAS offers consulting in marketing strategy, and selection and training of marketing personnel in India, Africa, Southeast Asia and the Middle East. Walter has published 14 books, three of them in collaboration with C. Northcote Parkinson of Parkinson Law fame. The 5Gs of Family Business is his sixth book published by SAGE. He has been a business journalist, having written a fortnightly column for Business World for 20 years, and for the Times of India for 10 years; has published over 900 articles in the business and general press. He was on the advisory board of the Journal for Management Consultants, USA. He is the only consultant invited to address three consecutive World Management Consultants meets in Rome, Yokohama and Berlin, and the World Marketing Summits in Dhaka and Tokyo. He has been president of the Institute of Management Consultants of India, founder-chairman of Asia Pacific Conference of Management Consultants, and later elected chairman of the International Council of Management Consulting Institutes, the world apex body. Walter is listed by Speakers Academy of Europe for speaking engagements worldwide. He has been a visiting professor at the Bajaj Institute of Management, Bombay University for 20 years, and he has lectured in the USA at Kellogg, Lake Forest, Rady, Drexel and Cornell, and also in Bangkok, Colombo, Singapore, Spain and Beijing. Walter now spends considerable time in NGO work and is chairman of the Consumer Education and Research Society; trustee of MoneyLife Foundation, IDOBRO; and has been advisor to WWF for Nature for many years. Walter is also the recipient of the Lifetime Achievement Award (LAA) for Consulting by IMC India in 2005, and another LAA for Marketing by Indys India in 2009.